ON THE JOB is an honest to goodness film. I am never an action movie person. But seeing its trailer, powerhouse cast and directed by the award-winning director Erik Matti made me believe that there's more to the guns and violent scenes. And I was glad I went to see this movie without thinking twice. Although I was never sure if this was intentional, but On The Job tackles the recent issues in the country - the power hungry government officials, the corruption, the underdogs and even the people who do their job right, but not given any credit for it. My heart was aching for hired killer, "Tatang" Mario (Joel Torre) and SPO1 Joaquin Acosta (Joey Marquez). Mario was doing the dirty work to provide for his family, and yet no matter how hard you wanted to hate him for killing people, you'd just cringe because all he wanted was to be a provider and to help his daughter Tina (Empress Schuck) finish law school. On the other hand, SPO1 Acosta was finding leads, trying to do his job because he was frustrated by a case that has been long unsolved but was taken away from him by NBI's Atty. Francis Coronel Jr. (Piolo Pascual). Daniel Benitez (Gerald Anderson) played the underdog in this movie. His naivety and his intention to earn for his family, despite being hired to kill is very believable. Daniel's role shined because he was the borderline of good and evil. And again, he was doing it for the job. Agitated by his promise to his in-law, Congressman Manrique (Michael de Mesa), Atty. 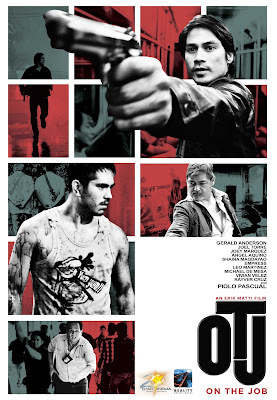 Coronel (Piolo Pascual) wanted an honest investigation. He wanted an ideal life. But I guess the reality always blindsides the ideals. And it clearly depicts here in this film. Overall, I give OTJ a 10/10 stars. Kudos to Direk Erik Matti for a no fuss and frills movie. I just absolutely respect him on how he handled the timely issues in its truest form. Cinematography-wise, it showed the realities of life and how he brilliantly showed it to his viewers. This is definitely an eye-opener for us Filipinos - that most of the time, the vile gets away because of power, money and influence. But it really is up to us if we wanted true change. And it's never too late to start. Oh and before I forget, OTJ is one of the films that has the most unexpected twist for an action movie. It left my jaw-hanging for quite sometime. Joel Torre and Gerald Anderson deserves to win an award for this. Thank you for breaking my heart in a different way. On The Job is still showing and is Rated-16 in cinemas. This is also part of the 20th Celebration of Star Cinema and co-produced by Reality Entertainment.